"Why did I have to be born so young? I'll show them. From now on I'm going to be an older woman!" 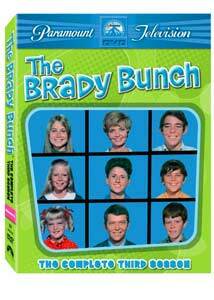 Paramount continues to fast track the releases of Sherwood Schwartz' "family" favorite, The Brady Bunch, bringing the third season's 23 episodes to DVD in this four disc set. Aside from the opening "The Brady Bunch in Color" segment no longer being present, the show continues to work its formula, but also features more location shooting. The season opens with a three-part story as the Bradys go on location on a trip to the Grand Canyon. Their first stop is a stay in Ghost Town U.S.A., where prospector, Jim Backus (Gilligan's Island) locks them up in the hoosegow, fearing they are after his claim. Next, it's the Grand Canyon or Bust as the family takes in the spectacular scenery, and rides the mule train to the canyon floor, where Bobby and Cindy go missing after deciding to follow a young indian boy. The gang then goes native in The Brady Braves. The kids are all a little older now, which allows the youngest Bradys a lot more quality screen time. Bobby (Mike Lookinland) is afforded the opportunity to ham it up on many occasions, and Cindy is starting to develop into a youung lady, carrying a lot more lines. Bobby is depressed that he is still a small fry in Little Big Man, but comes up big in the end, while Cindy (Susan Olsen) shows her frustration at still being considered a kid by her siblings (Cindy Brady, Lady), until she gets a secret admirer. The pair team up to break a world record in The Teeter-Totter Caper when they are snubbed from attending a wedding. The two also find themselves in a conflict of interest when their testimony in a traffic accident implicates their mother (The Fender Benders). The middle kids both battle with finding their identity�Jan (Eve Plumb) has a problem coping with living in Her Sister's Shadow and resisting the idea she needs glasses (The Not-So-Rose Colored Glasses). When she discovers a photo bearing a striking resemblance to herself, it Peter (Christopher Knight) tries to adopt a new personality believing he is too dull (The Personality Kid), and threatens the family's shot at stardom, when his voice begins breaking right before the kids have an important recording session booked (Dough Re Mi). Pete's eavesdropping has the rest of the kids up in arms (The Private Ear), and he gets the "scoop" on The Power of the Press when he signs on as a reporter for the school newspaper. The oldest kids have their own challenges. With his driver's license in hand, Greg (Barry Williams) decides he needs his own wheels, but gets suckered into buying a lemon (The Wheeler-Dealer), and his attitude gets a reality check when he makes a errant bet with Bobby (The Big Bet). Greg gets upset when Marcia starts dating his school rival (My Sister, Benedict Arnold), and is at odds with mom over his football activities (Click). In Juliet is the Sun, Marcia suffers from a lack of confidence after landing the lead role in the school play, but the family's efforts to bolster her spirits turn her into an egomaniac, then, as president of his local fan club, she gets into a jam after promising her friends that heartthrob Davy Jones (himself) will appear at the school prom (Getting Davy Jones). Marcia's philanthropy comes back to haunt her when she decides to help wallflower, Molly (Debi Storm), live up to her potential (My Fair Opponent), only to find her a rival for a pretigious school assignment. While the adults play a part in every story, neither really get their own feature storylines, the exception being Anne B. Davis adopting an alternate personality as she plays a dual role as Alice's cousin, Emma, a hard-nosed, army veteran set on shaping up the Brady household, to everyone's objection. Another source of chuckles are not only the gaudy seventies styles (which not surprisingly are making their way back into current fashion), but also the number of (likely) unintended continuity errors, or situations that defy logic, such as Bobby finding himself in trouble after climbing a ladder to fix the shutters on the girl's bedroom window�a location easily reached from inside the house. Looking at it now, in many ways, this show could have served as a service guide for the American family. The kids, while getting into trouble, always manage to see the error of their ways before anything too major occurs, and serve as role models for the ideal children. Mike and Carol's handling of the many situations offers an example for parents, demonstrating that sometimes they need to just let their kids learn their lessons without interference. It's interesting to see just how they handle the many challenges they run into. The most important part of the Brady household is the underlying respect for parental authority, and the recognition by the adults that their kids are maturing ad have to be able to make decisions on their own. They also have to bear the responsibility for their actions, but no matter what the crime, there is a family unit to support them when they fail, and herald them in their successes. Image Transfer Review: Like the first and second seasons, there are a few different generations of source material present. The best segments have vibrant, well saturated colors, and a clean, highly detailed look. In the lesser quality segments, saturation and contrast take a hit, washing out colors, and whitening flesh tones, with an overall greenish cast to things. Some of these scenes are a lot softer. Blue eyes seem unnaturally brilliant and almost glow in places. Although there are noticible shifts throughout the season, I can't remember the show looking this good, despite not being pristine. I can only assume that many of the inferior segments were originally cut for syndication, and had to be restored from poorer sources. Audio Transfer Review: Audio is fine for the most part, but suffers from a good deal of distortion in many episodes, which may have originated in the original recording. Dialogue is easy to understand except when purposly obscured with thew whole cast shouting at once. There are a few places where dialogue seems out of sync. Overall this is still very serviceable, but far from perfect. 3 Other Trailer(s) featuring McGyver, Charmed, Airplane! Extras Review: It is somewhat disappointing that the cast extras included on the first season haven't continued in seasons two or three. A Play All feature and seven internal chapters per episode continue to be included. The set remains consistent in the series packaging�a pair of dual thinpaks housed in a sturdy outer box with a lenticular cover. Forced, but skippable, trailers open the first disc. These include McGyver, Charmed and Airplane! Special Edition DVD. The Brady Bunch remains as entertaining today as it was back when I was a kid, and the writing is always witty and full of the family hijinx we've come to expect from the show. Recommended.